The Namibian branch of AfricAvenir organises the film series “African Perspectives”, which has an impressive line-up of films that will be screened for the next several months in Windhoek, the capital. Founder and director Hans-Christian Mankhe talked to me about the important role of women in all facets of the organisation and film initiative. I was struck by your enthusiasm regarding women’s place in cinema even before we met in person in November 2011 in Harare at the International Images Film Festival for Women, to which you were invited, as I, to serve on the main jury. 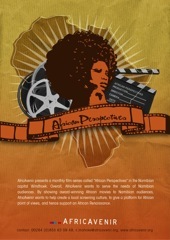 You are the founder and director of the film series “African Perspectives”, how did this come about? In 2005-2006 while I was still living in Berlin, we planned the screening series “African Reflections – Female Directors in Cinema” which focussed on female filmmakers from Africa. There I came in touch with filmmakers like Dyane Gaye among others, although I moved to Namibia before the series kicked off. In 2006 I founded the Namibian branch of AfricAvenir, whose board and members consists of 50% women. In Windhoek I created the film series “African Perspectives”, and since 2007 we have been screening African films once or twice a month. To date we have shown more than 60 African films to the Windhoek audience. I am very impressed with the 2012 film list! For a small film series with not a lot of resources I commend you for being able to pull it together, and of course women are very visible. Our programme for the rest of the year is pretty much in place; amongst them are films by women, such as Satin Rouge by Raja Amari, Soul Boy by Hawa Essuman, and Cameroun, autopsie d’une Indépendance by Valerie Osouf. I am particular happy that we are screening the film by Valerie Osouf. AfricAvenir translated the film from French with German and English subtitles to make the film accessible for non-French speaking audiences. It is such a great film on the process of Cameroon’s independence, and the behind-the-scenes of all that was involved, which lead to the murder of the potential first president Um Nyobe, killed in the same way as Sankara, Sobukwe, Lumumba and Cabral. But we hardly hear about Um Nyobe. Valerie has made a significant contribution to change this. And I am also very happy that we will screen Ramata by Alain-Leandre Baker, who prominently features a woman as the main character. As like L'Absence by Mama Keita, which will screen at the end of April, Ramata is a brilliant film from the continent. In the past we had other films by women, such as Karin Albou’s The Wedding Song. Otelo Burning by Sara Blecher, Wanuri Kahiu’s From a Whisper, Ingrid Sinclair’s Flame (which was also co-produced by Bridget Pickering), Valley of the Innocent by Branwen Okpako, Daphne Valerius’s Souls of Black Girls, among others. We had Tsitsi Dangarembga as one of our special guests at the film series screening. Around that one event we held the Women Filmmakers Get-together Breakfast, during which there was a screening of her films in cooperation with Sister Namibia, a women's rights awareness raising NGO. When we have Q&A’s after the screenings, we often feature very prominent Namibian women from the centre of society, public figures like Ellen Namhila, director of University of Namibia library, now one of our board members; senate member and author, Ambassador Nora Schimming-Chase; Naita Hishoono, a board member of AfricAvenir and director of Namibia Institute for Democracy; Anne Gebhardt, director of Namibia Women’s Summit; Sandra Tjitendero, widow of the first Parliament President of post-independence Namibia. And we have had films by male directors who put women at the centre. Examples include Jean-Pierre Bekolo’s Les Siagnantes, Med Hondo’s Sarraounia, Moussa Sene Absa’s Madame Brouette, Ousmane Sembene’s Moolaade” and documentaries like Zola Maseko’s The Life and Times of Sara Baartman. These films are very relevant and are part and parcel of the African film landscape. Hence, why should we exclude them? Be it good films on women made by men, or good films made by women, they have a right, like anyone else to reach the African audience. They are made first and foremost for African audiences. The filmmakers, both male and female, are trying to tell us something. They are talking to us, to African societies. Hence we must screen their work to enable them to raise their voices and engage in a dialogue with us.